Romano is my dad. I’ve talked about him before, mostly to point out that his criticism of other people’s cooking is not what you’d call gentle or sensitive or, well, nice. He once made eight-year-old me cry when he told me my risotto was a gluggy, gluey, inedible mess. You see, Romano lives his life by a strict set of edicts which govern all aspects of his dietary intake. You could call it Romano’s Code, and he expects others to understand and respect his Code. There’s Romano’s way – salads should always be dressed with olive oil and vinegar not abhorrent concoctions that involve mayonnaise or, God forbid, yoghurt – and then there’s the wrong way. Romano’s Code doesn’t just cover cooking, it extends to dining etiquette as well. If, for example, you find yourself eating dinner at Casa Cammarano and think it is OK to just pluck a few random grapes from the requisite fruit platter that appears after every meal, you are sadly mistaken. The right thing to do is to take a small bunch, stalks and all. Romano doesn’t care if you’re a daughter, a cousin, a new boyfriend or the parish priest, commit this sin and you’ll hear about it loudly and for a long time afterwards. You might be embarrassed, but then Romano believes you should be. 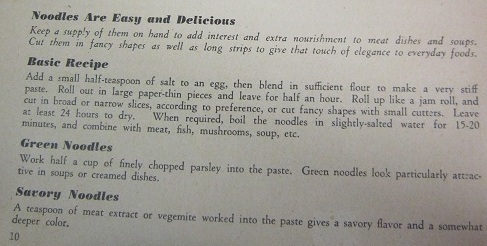 So when I came across this 1950 recipe for “Noodles” with a variation that called for the adding of “a teaspoon of meat extract or Vegemite” in Wynwode Reid’s New Australian Cookery Illustrated, I knew, in the name of Italo-Australian cuisine, it had to be tried. And I also knew the person to try it should be Romano. Note the Vegemite variation under “Savory Noodles”. I set about making it happen. 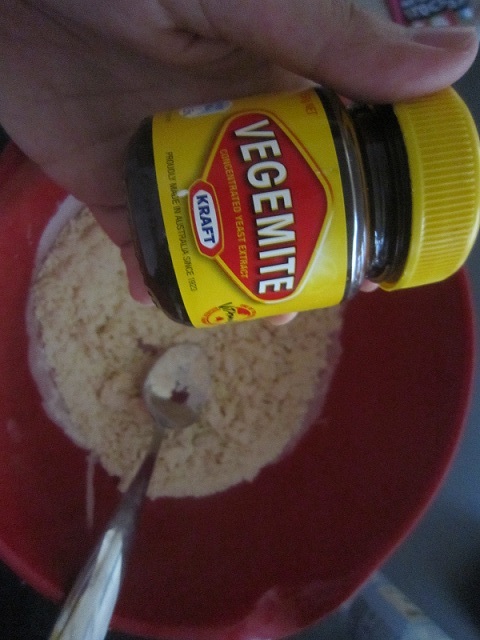 In a bid not to prejudice his palate, I decided I would keep the Vegemite a secret. Romano, like most Italians, is not a fan of the inky black substance – he’s more a Nutella man. I’m sure if I told him I’d taken what has been the staple of his ancestors for centuries, and mixed in a spoonful of Vegemite, he would see it as a betrayal of his culture and, worse, a clear contravention of Romano’s Code. Following the instructions proved to be as simple as mapping the human genome, but somehow I managed it. In the middle of the task mum rang to say Nonna was expecting me for dinner. Perfect, I thought, ignoring the line that said “Leave at least 24 hours to dry”, dad can try the noodles then. Unfortunately, by the time my ribbons of latte-coloured pasta had been transported in their plastic box from the city to Spotswood they had turned into mounds of stuck-together dough. 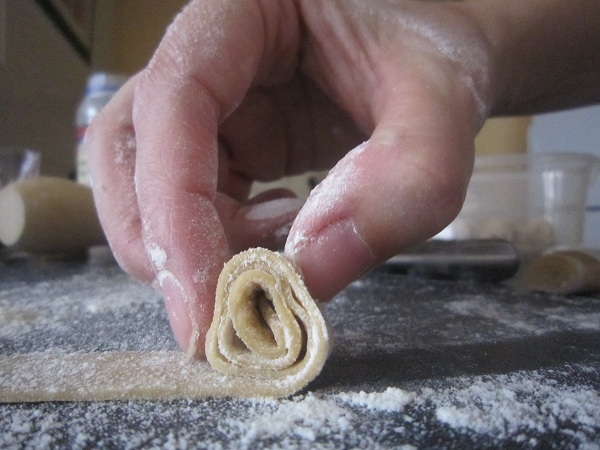 “Not you worry,” said Nonna and we set about re-rolling the pasta into little twists. Romano entered and pointed out that they looked like something the dog did. This was not a good start. But cooked and covered in Nonna’s sauce, Romano didn’t immediately turn up his considerably-sized nose. “You used wholemeal flour,” he accused. He took a little. He chewed it thoughtfully. He took a little more. “Is it alright?” I asked timidly. “Vegemite!” I proclaimed triumphantly, ready for his face to turn from apathetic to angry. So, there you have it, when Romano ate Vegemite pasta, there was no yelling of cultures double-crossed, of codes violated, of anything really. 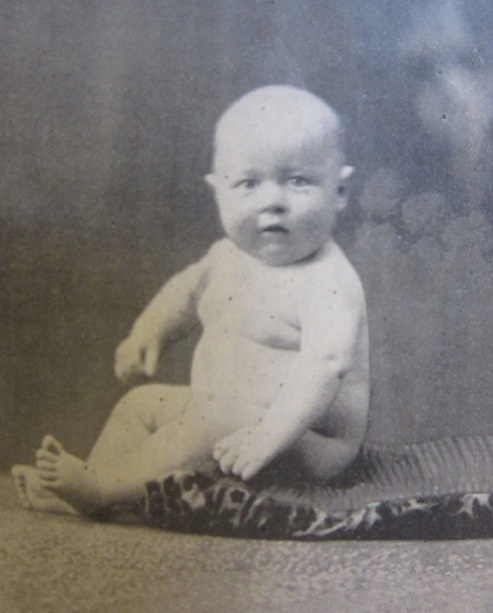 It just didn’t seem right – who was this man? This wasn’t how my father should react to Vegemite pasta, of all things. Had I slipped into a parallel future, an alternate 1985 of sorts? Where was the outrage? What did I have to do to provoke that? And then grapes presented themselves for dessert. I plucked a few from the stalks, and Romano did his thing. Everything was right in the world again. 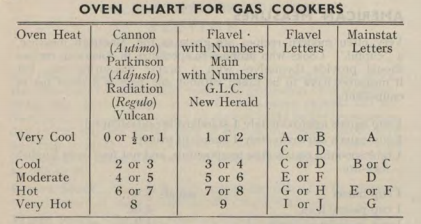 I decide it’s pointless to complain about the back-breaking height of the stove – if that’s how Nonna wants it, that’s how it will stay – and instead ask where everyone is. Nonna mumbles some more about my mother’s lack of interest in all things culinary and tells me to weigh out 800 grams of sugar and 1 kilo of almonds. Really? Weigh stuff? Nonna never weighs anything and I call her on it. The sugar goes in the pan over low heat. Nonna watches it and explains we are waiting for it to turn to honey. Not sure how sugar can turn into honey but, again, it’s not an argument worth having. I get on top of a chair and take the following pictures, and then I get in trouble. Lost in memories of flesh-toned pants past, Nonna points out that the sugar has in fact turned into a honey-like syrup, so we should now add the almonds. This is where the fun starts and where you see an 89-year-old woman who only 10 minutes before said “I hurt so much, I can’t move AT ALL! 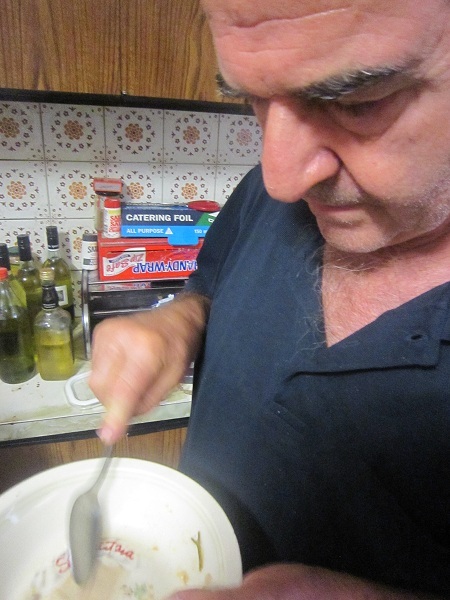 Old age is awful, my granddaughter, awful!” stir the sticky mess of almonds and sugar like it’s whipped cream. Sure, she does some Monica Seles-style grunting towards the end, but I have to practically bribe her to take the wooden spoon away from her. Finally it’s time to tip the molten brown sugar coated almonds out on to an oiled marble slab. I don’t know how Nonna knows it’s ready. I ask her and she says she knows it’s ready, because it’s ready. Getting the almonds out is not so easy, as everything’s sticking to everything and it’s hot as Hades. That does not stop Nonna. She uses a range of wooden spoons, palates and a rolling pin to get it how she wants it. Then she dips her hands in cold water and pats it down. I try to mimic her, but my hands actually feel heat, so I give up. I tell her what Nonna said about her lack of help, she sighs and starts the next lot of torrone. I think she’s used to it. 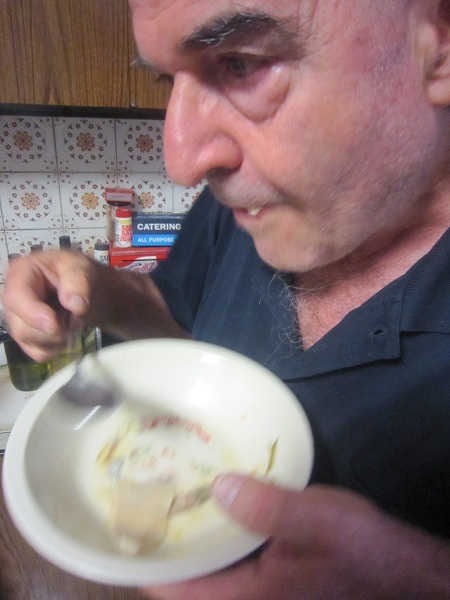 Dad meanwhile takes some very menacing knives off Nonna and starts cutting the torrone into pieces. This requires a fair degree of stamina, and as we have not had coffee for at least an hour, Nonna decides that’s what she should be doing. The answer to which is, of course, I have no idea. 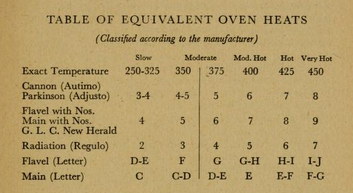 You will need a marble slab and hands that are not sensitive to heat. It’s also a good idea to share the stirring with a number of people, as it is heavy, hot and difficult. Oil the marble slab and have a bowl of cold water for you to dip your hands in nearby. Place the sugar in a large saucepan and stir over low heat until sugar has dissolved. Add almonds. Stir with a wooden spoon until the almonds start to stick together. 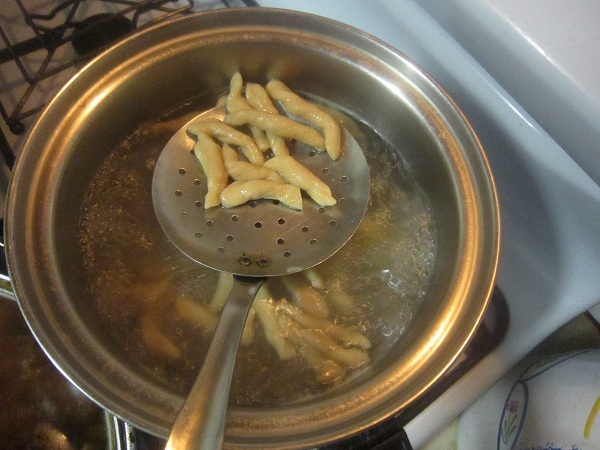 Add the lemon juice and continue stirring until the almonds and sugar are golden brown in colour. While the mixture is still warm, sprinkle hundreds and thousands over it, cut the slab into slices, and then into small squares. Place on plates lined with rice paper. Roast turkey, mince pies and shortbread. This is what a foreign Christmas sounds like to me. The same goes for fruitcake, stuffing, pudding and Christmas crackers. Totally exotic. My unfamiliarity with all things Anglo-Christmas is my family’s fault. 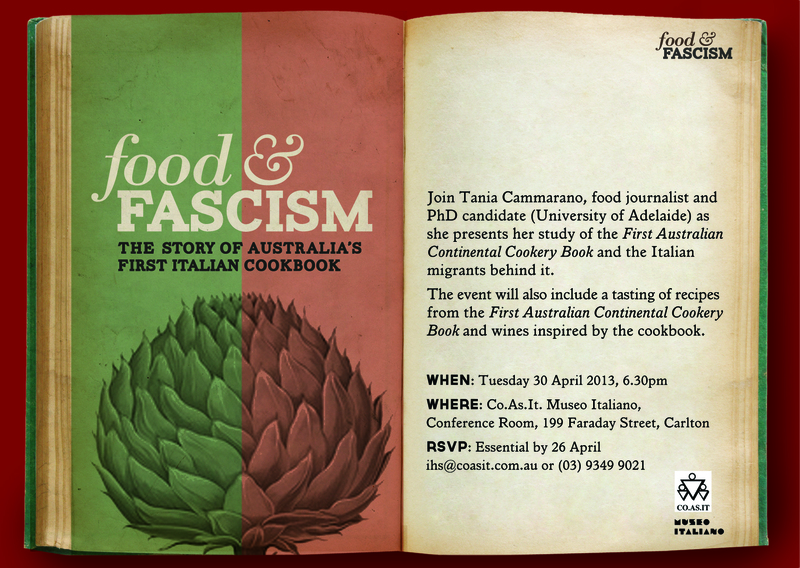 My mother is Sicilian, my father is from near Naples, and I was born in Melbourne, but if what you eat is who you are then I am definitely Italian. No question. 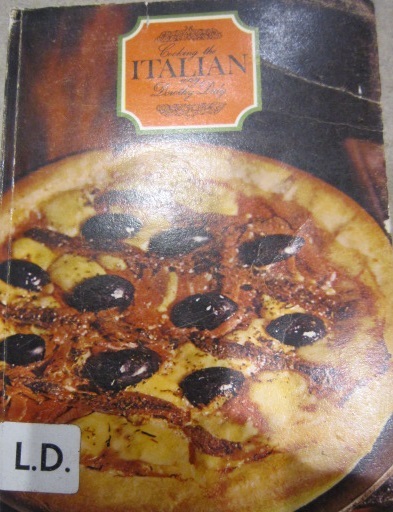 Or, to be more precise, southern Italian. Like all good southern Italians, our Christmas meal starts with homemade pasta. In my house, these take the form of panzerotti. Now, the thing about pasta and Italians is that one man’s panzerotti are another man’s crespelle. By this I mean that depending on where you are in the tall skinny boot known as Italy, pasta often has the same name but can be something quite different. 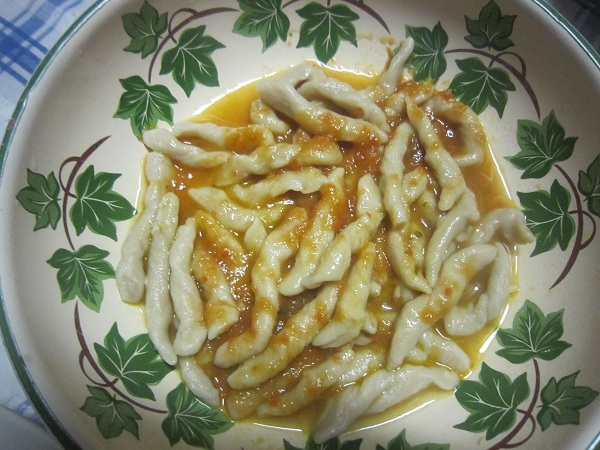 In casa Cammarano, however, the panzerotti are made by Romano, my father, and are precise little half moons of pasta filled with ricotta, parmesan and parsley, sealed with a fork, boiled in water, and served with a fresh tomato sauce. Perfect. However, occasionally people who are not my father get involved in the making of perfection, and things inevitably go wrong. These people, Romano’s children and his mother-in-law, in particular, don’t particularly care if a complete circle has not been cut out of the pasta, making it impossible to create a proper half moon. Or they are sloppy in the way they seal the panzerotti, meaning when you cook them, they burst open and their ricotta filling is lost to the raging boiling water around them. While panzerotti were and still are the specialty of Mr Cammarano, my mother Lidia, or, as she hates to be called, Lil, always makes ricotta cake. The recipe for this cake goes way, way back to an ancient and sacred Italian cookbook that no one can remember the name of and has since been lost. But the cake lives on in the memory of Lidia, who will not share the recipe because it’s hers and hers alone. Even though she claims the book has been lost, I think she destroyed it to protect her ricotta cake-making monopoly. But I digress. It is a delicious cake, no doubt about it. 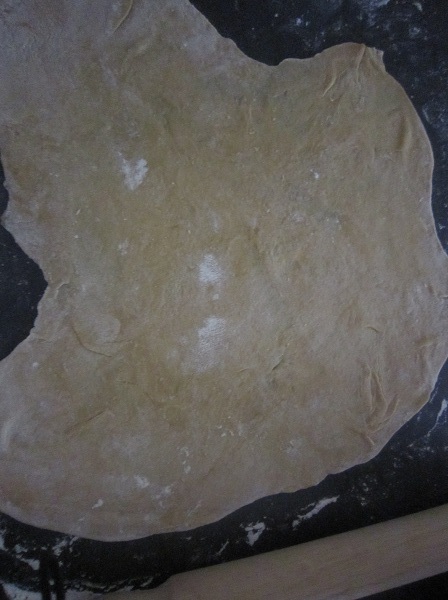 The pastry crust is short and contains orange zest. My mother doesn’t believe in making her own pastry – she outsources it to my grandmother, who brings it to her house already rested and rolled out, in a glass Pyrex dish with crinkled edges. The filling is fresh ricotta, cinnamon, eggs and caster sugar. There might be more, but Lil isn’t telling. It’s baked in the oven and then dusted with icing sugar. We eat it during the entire Christmas period – it is the fuel that keeps us going and propels us through everything festive from gift buying expeditions and loud card games to visiting friends and midnight mass. Whilst it is starting to sound like ricotta is at the centre of my Italian Christmas, it’s not. Torrone is. Torrone is the Italian word for nougat but my grandmother’s version is not the snowy white version you are probably most familiar with. 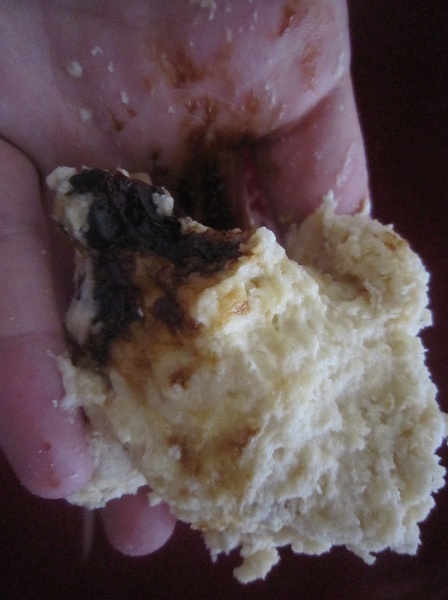 This one is made mostly of almonds and sugar, and is caramel brown in colour. To make it you must have the strength of 21 men, four oxen and three donkeys. Your hands must be capable of withstanding nuclear plant meltdown levels of heat. Or you must be my 89-year-old grandmother. She makes it, and has always made it, by herself. True, these days, she lets me or my mother occasionally have a turn at stirring it, but she waits impatiently as you try to churn the spoon, her eagle eyes watching for any signs of fatigue. It doesn’t take long – and as soon as you pause, she’s taken the spoon and is back at it again, and you’re left wondering why you’re standing exhausted while a woman four times your age, and a quarter of your size, is moving nearly 2 kilos of sticky, heavy sugar and almonds. It might seem a good idea, at this point, to give you some of the recipes for these tasty Christmas treats. However, my father would not give his recipe for panzarotti, on the grounds that you will not make them as well as he does. My mother would not give her recipe for ricotta cake, for the reasons stated above. My nonna, however, has provided her recipe for torrone. Because nonna is good and kind and just, and knows that as there’s no way you’re as strong as she is, trying to make it will probably kill you anyway… so look out for Nonna Maria’s Torrone in the next post (complete with pictures, I promise)! In the meantime, tell me if this Christmas is anything like yours? Today I went to Sabina’s nonna’s funeral. Sabina’s nonna was everything a nonna should be. Loving, strong, could cook for 50 people without breaking a sweat and could gossip for at least two countries – Italy and Australia. She knew everything that was going on. Kind of like Google, but only for things that really mattered like births, deaths, marriages, pregnancies and, most importantly, scandals. 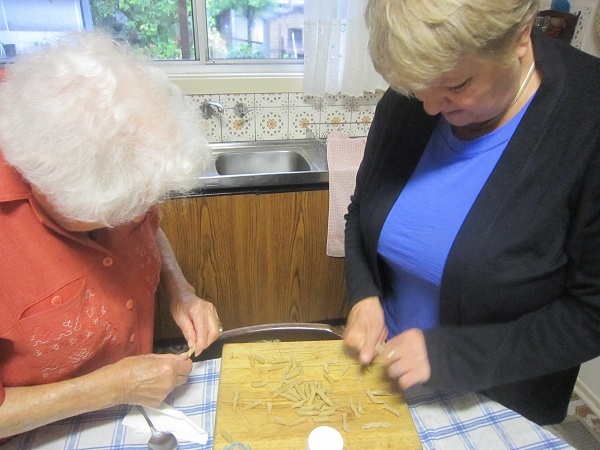 It’s easy to forget what nonnas like Sabina’s nonna did. With maybe a few suitcases and a few kids, they moved to a country where they didn’t know the language or the culture or the customs. But did it faze them? Nup, they got right on with it and set about creating a new life, their own little empires, rich with children, grandchildren and great-grandchildren. So here’s to nonnas who have passed, and to nonnas who are still with us. They demand our respect. RIP Maria Curatolo.